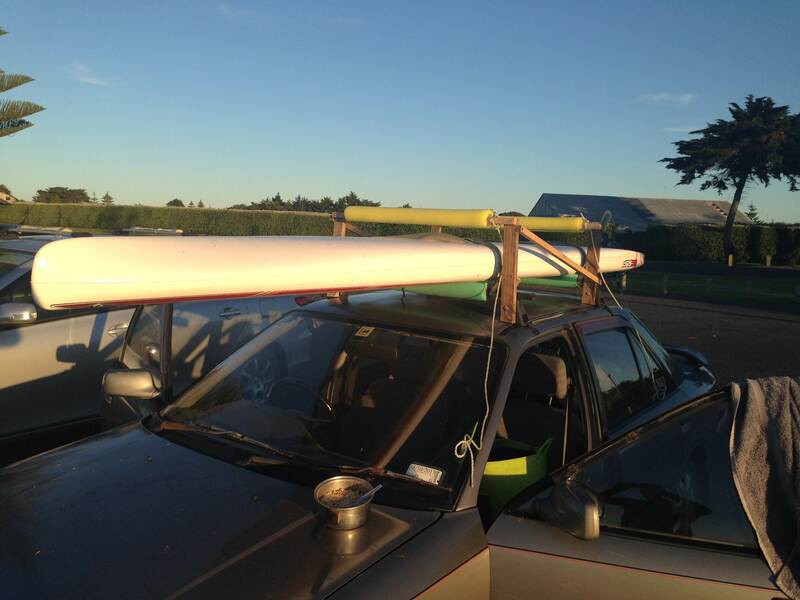 thinking about custom 3 board sup rack for small japanese saloon......anyone done a custom rack using front and rear ends bolted to vehicle chassis......rather than using all that flimsy gutter mount stuff? Have you thought about a combination of roof racks and tow bar mounted rack like this...? I rivetted some tracks from rola to the roof of my camry, they work good. I have installed roll cages in cars which attached to the chassis, definitely possible to go from the chassis up through the roof but it would be an ugly job. That was one of my "good ideas"
I also note the "porridge saucepan".......essential early morning surf equipment. Are we allowed to drill holes through our car roofs or door pillars to attach anchor points for board attachments? How can a post about sunday afternoon phone calls be considered detrimental to general sup morale and protocol? Nothing in the rule book to so you can't drill holes . dont forget the silicone ,for a good down pour . And a little bit of silicon on the bolt to be sure to be sure .laddie. make sure you measure .before drilling ...you don't want a siv for a roof . and don't take out your interior light . Ive never drilled a wrong hole in my life whoops . it s a custom .